Hurricanes & climate change: landfalls | Climate Etc. Total basin and global hurricane statistics are most easily related to global and regional climate variability and change. However, landfalling hurricanes are of particular interest owing to their socioeconomic impacts. Economic losses from landfalling hurricanes have increased in recent decades, both in the U.S. and globally. Identifying a signal from manmade global warming in the increased losses requires identifying a trend that can be attributed to manmade global warming in any of the factors that contribute to economic losses from landfalling hurricanes. These factors include: hurricane frequency, intensity, horizontal size, storm surge, rate of motion near the coast, tornadoes and rainfall. Klotzbach et al. 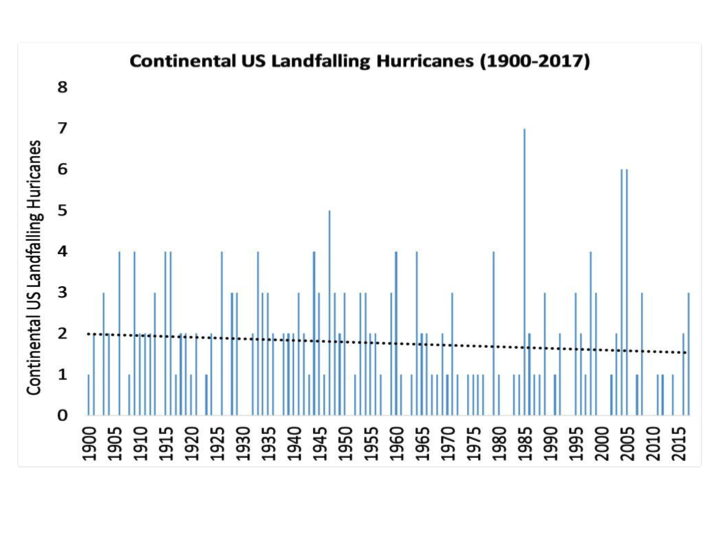 (2018) have conducted a comprehensive evaluation of the landfalling hurricane data for the Continental U.S. (CONUS) since 1900. Figure 5.1 (top) shows the time series of U.S. landfalling hurricanes for the period 1900 to 2017. While the largest counts are from 1986, 2004 and 2005, there is a slight overall negative trend line since 1900 that is not statistically significant. Figure 5.1 (bottom) shows the time series for major hurricane landfalls (Category 3-5). The largest year in the record is 2005, with 4 major hurricane landfalls. However, during the period 2006 through 2016, there were no major hurricanes striking the U.S., which is the longest such period in the record since 1900. 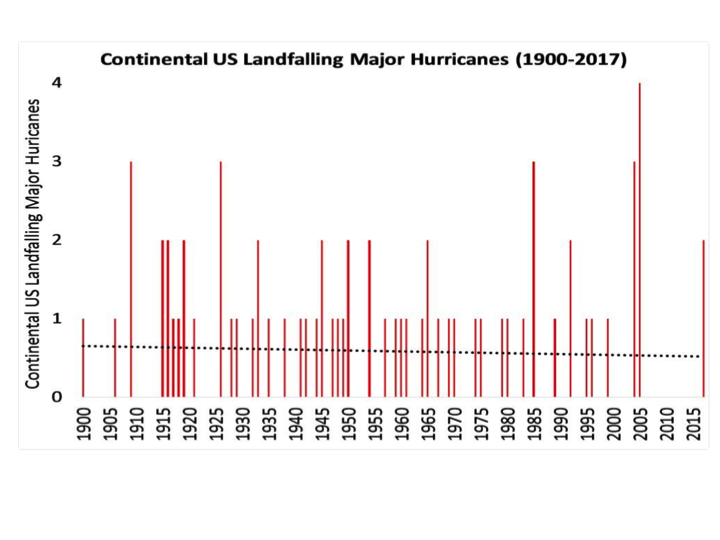 Figure 5.1 Time series from 1900 to 2017 for continental U.S. landfalling hurricanes (top) and major hurricanes (bottom). The dotted lines represent linear trends over the period, although neither of these trends is statistically significant. Source: Klotzbach et al. (2018). Villarini et al. (2012) provide an analysis of U.S. landfalls back to 1878 (Figure 5.2). While it is possible that some landfalls were missed in the early decades owing to sparsely populated regions on the Gulf Coast, it is remarkable that the highest year in the entire record, with 7 landfalls, is 1886. 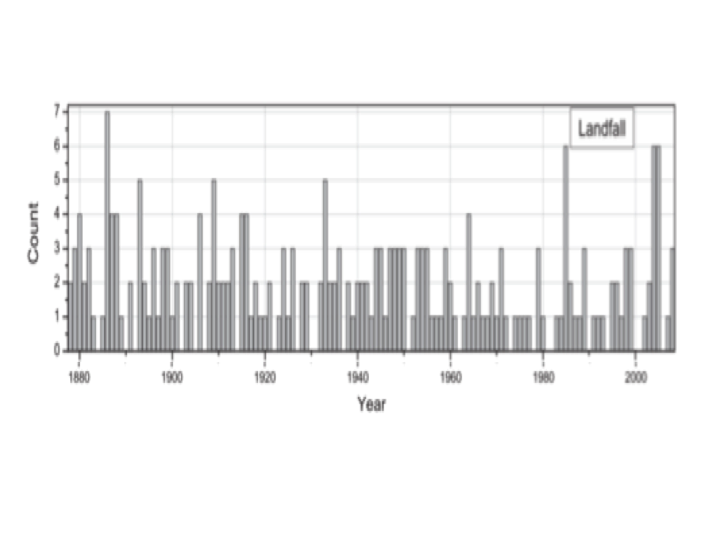 Figure 5.2 Time series of the count of U.S. landfalling hurricanes for the period 1878 – 2008. From Villarini et al. (2012). An energetic perspective on U.S. landfalling hurricanes is provided by Truchelut and Staehling (2017). 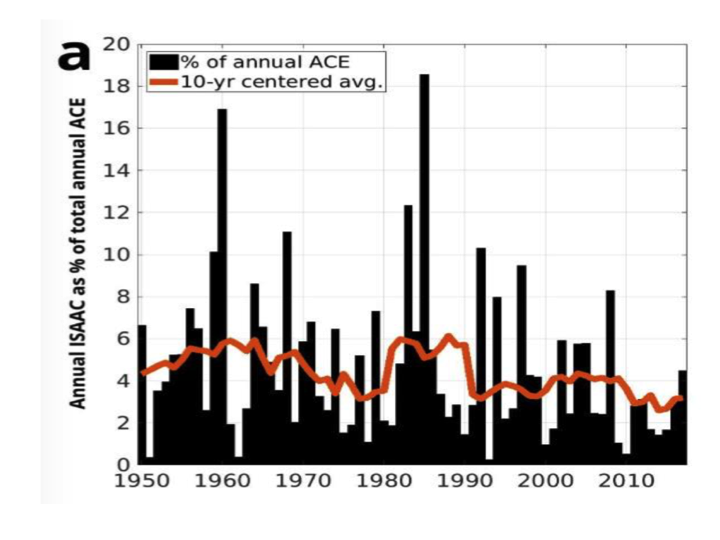 Figure 5.3 shows the time series of continental U.S. landfalling Accumulated Cyclone Energy (ACE), referred to as Integrated Storm Activity Annually Over the Continental U.S. (ISAAC). 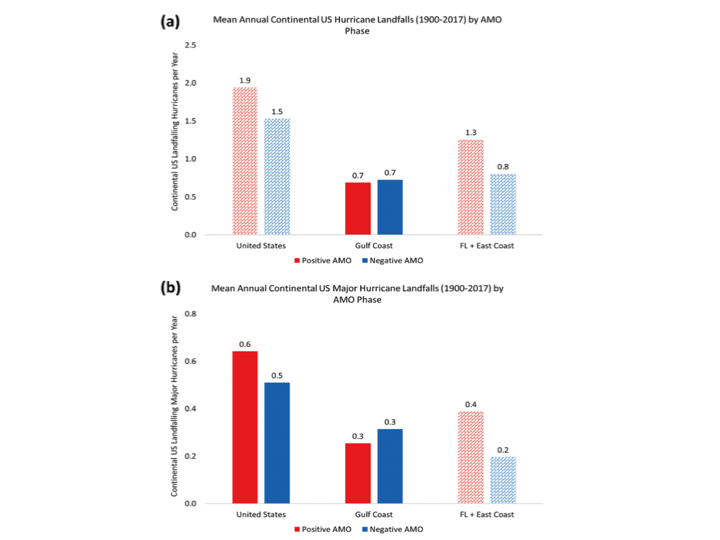 The 2006  2016 drought of U.S. major hurricane landfalls is associated with a landfall ACE value that was less than 60% of the 1900-2017 average. Figure 5.3. Timeseries of ISAAC for 1900-2017, with a ten-year centered average value (red). From Truchelut and Staehling (2017). Truchelut and Staehling (2017) illustrate how the overall Atlantic basin hurricane activity does not directly relate to U.S. landfall activity in a consistent way. Figure 5.4 shows the landfalling ACE (ISAAC) as a percent of overall Atlantic basin Accumulated Cyclone Energy (ACE). The drought in major landfalling hurricane between 2006 and 2016 has the lowest decadal value of this ratio since 1950. Figure 5.4: Time series of proportional ISAAC over 1950-2017, expressed as a percentage of the annual cumulative ACE occurring in the Atlantic Basin, with a ten-year centered average (red). From Truchelut and Staehling (2017). Substantial interannual to multidecadal variability in U.S. landfall activity is seen in Figures 5.1 to 5.4. Klotzbach et al. (2018) examined how the landfall counts vary with ENSO (El Niño versus La Niña) and the warm versus cold phases of the Atlantic Multidecadal Oscillation (AMO). Figure 5.5 compares U.S. landfall frequency during El Niño versus La Niña years. About 1.75 times as many hurricanes make U.S. landfall in La Niña seasons compared with El Niño seasons. Klotzbach et al. found similar ENSO-related modulation in both Florida and East Coast landfalls as well as Gulf Coast landfalls. The La Niña-to-El Niño ratio is slightly larger for major hurricane landfalls than for all hurricane landfalls, although the increase in hurricane landfalls observed in La Niña seasons from that observed in all seasons does not meet the 5% significance level. Figure 5.5: (a) Mean annual CONUS landfalling hurricanes by ENSO phase from 1900 to 2017, and (b) mean annual CONUS landfalling major hurricanes by ENSO phase from 1900 to 2017. Differences that are significant at the 5% level are plotted with diagonal hatching. Klotzbach et al. (2018). Figure 5.6 compares CONUS landfall counts for the warm versus cold phase of the Atlantic Multidecadal Oscillation (AMO). Klotzbach et al. (2018) identified a significant modulation between positive and negative AMO phases for Florida and East Coast landfalls. Figure 5.7 shows the number of CONUS landfalling major hurricanes by decade. Why were there fewer landfalling major hurricanes in the decade 2001 to 2010 versus 1941 to 1950, both decades at the peak of the Atlantic Multidecadal Oscillation (AMO)? Figure 5.7 shows that there arguably were more major hurricanes in the Atlantic basin during the earlier, mid-century AMO. The explanation probably lies in the relative frequencies of El Niño versus La Niña years during these two warm periods, with the current warm phase of the AMO being dominated by a relatively large number of El Nino years that are associated with low Atlantic hurricane activity. Figure 5.7 Plot of major (category 3 or higher) hurricanes hitting the lower 48 states. Source: Roy Spencer. Kossin (2017) identified an increased tendency for enhanced vertical wind shear near the continental U.S. in the warm state of the Atlantic Meridional Mode (AMM) as a potential contributor to diminished landfall efficiency in active seasons. During periods of greater Atlantic hurricane activity, a protective barrier of vertical wind shear and cooler ocean temperatures forms along the U.S. East Coast, weakening storms as they approach land. Likewise, during periods of low activity, the sea surface temperatures are cooler and the wind shear is stronger there. When conditions in the tropical Atlantic are good for hurricane intensification, they are bad for it near the coast and vice versa. The Arc horseshoe temperature pattern in the Atlantic (Figure 4.3) illustrates the spatial pattern of Atlantic surface temperatures associated with AMO. The east-west pattern of warm-cool temperatures influences the ratio of landfall ACE to total basin ACE (Figure 5.4), resulting in the opposing tendencies of hurricane intensification near the Atlantic coast versus in the Atlantic basin. Klotzbach (2011) summarizes Caribbean landfalling hurricanes (Figure 5.8). It is seen that there is no significant long-term trend. The primary interannual driver of variability in the Caribbean is ENSO, whereby much more activity occurs in the Caribbean with La Niña conditions than with El Niño conditions. On the multidecadal time scale, the AMO plays a significant role in Caribbean hurricane activity. When ENSO and the AMO are examined in combination, even stronger relationships are found. For example, 29 hurricanes tracked into the Caribbean in the 10 strongest La Niña years in a positive (warm) AMO period, compared with only two hurricanes tracking through the Caribbean in the 10 strongest El Niño years in a negative (cool) AMO period. 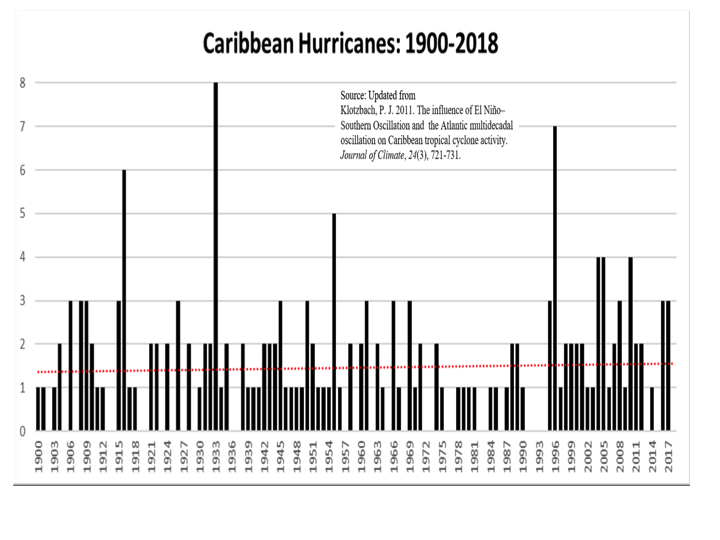 Figure 5.8: Caribbean landfalling hurricanes, for the period 1900-2018. Updated from Klotzbach (2011). Chenoweth and Divine (2008) provide a longer-term perspective on Caribbean landfalling hurricanes by assembling a historical document-based 318 year record of tropical cylcones impacting the Lesser Antilles, for the period 1690-2007. Newspaper accounts, ships’ logbooks, meteorological journals and other document sources were used to create this data set. This compilation estimates the position and intensity of each tropical cyclone that passes through the 61.5°W meridian from the coast of South America northward through 25.0°N. The numbers of tropical cyclones show no significant trends (Figure 5.9). The period with the largest number of landfalls was in the early 19th century. The time span 1968–1977 was probably the most inactive period since the islands were settled in the 1620s and 1630s. Figure 5.9. The number of (top) hurricanes, (middle) tropical storms, and (bottom) both hurricanes and tropical storms passing through 10–20°N 61.5°W from 1690 to 2007. Red curve is a 21-year moving mean. Weinkle et al. (2012) summarizes the challenges in constructing a homogeneous global hurricane landfall data set. Uncertainty in tropical cyclone location and intensity data is a function of the evolving observation network throughout the past century, ranging from ship traffic, aerial reconnaissance, to satellite remote sensing. Weinkle et al. (2012) examined landfalls in the North Atlantic, northeastern Pacific, western North Pacific, northern Indian Ocean, and the Southern Hemisphere, using the International Best Track Archive for Climate Stewardship (IBTrACS). 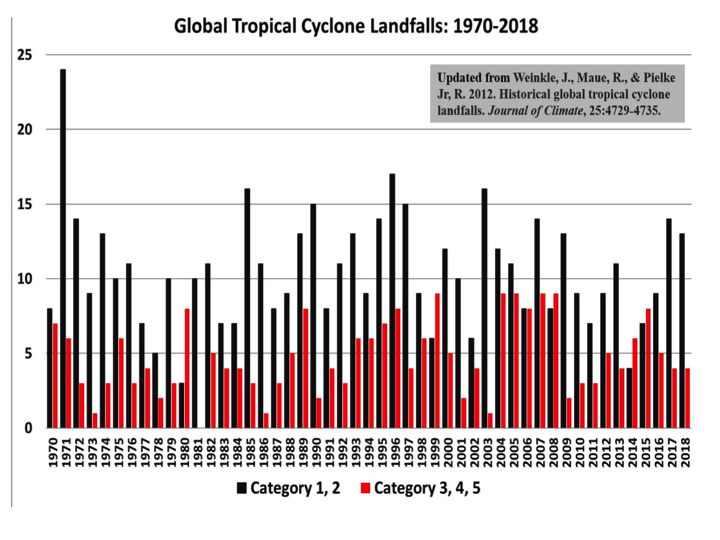 The global frequency of total and major hurricane landfalls shows considerable interannual variability, but no significant linear trend (Figure 5.10). Furthermore, when considering each basin individually, there is no significant trend except in the Southern Hemisphere. This result is not unexpected considering the known multidecadal signals in tropical cyclone activity, which cannot be adequately resolved by the short historical record. 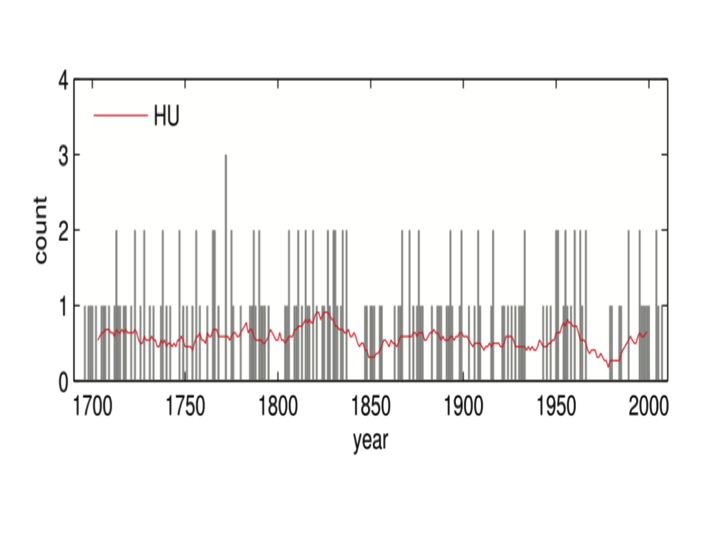 Figure 5.10: Frequency of global hurricane, for the period 1970-2018. Updated from Weinkle et al. (2012). Mei et al. (2015) investigated the intensity of landfalling hurricanes over the northwest Pacific since the late 1970s. Over the past 37 years, hurricanes that strike East and Southeast Asia have intensified by 12-15%, with the proportion Categories 4/5 storms more than doubling. In contrast, typhoons that stay over the open ocean do not reflect such an increase. They found that the increase in intensity of landfalling hurricanes is tied to locally enhanced surface warming on the rim of East and Southeast Asia. As summarized by Camargo et al. (2010), ENSO’s influence on western North Pacific hurricane tracks is reflected in the landfall rates throughout the region, with different landfall patterns associated with ENSO phase. There is a significant relationship between late season landfalls over China and ENSO. There is also an increase in landfalls in the Korean Peninsula and Japan during the early monsoon months and in the Indochinese peninsula during the peak monsoon months in El Niño years. Historically, the most deadly and damaging impacts of hurricanes have been storm surge and inland flooding. (Blake et al. 2011). This section assesses whether there has been in any increase in storm surge and rainfall associated with hurricanes. It has been estimated that on average, tropical cyclones of at least tropical depression strength contribute about a quarter of the annual rainfall in the southeast U.S. Soule et al. (2012) found that tropical cyclones in the Southeast U.S. frequently ‘bust’ droughts, with the majority of counties in Florida, Georgia, South Carolina and North Carolina seeing at least 20% of their droughts ended by a tropical cyclone between 1950 and 2008. Hurricanes also account for approximately 20% of the observed monthly rainfall from June to November across the eastern U.S. Corn Belt (Wisconsin, Michigan, Illinois, Indiana, Ohio and Kentucky) (Kellner et al. 2016). While inland flooding typically occurs with a landfalling hurricane, several factors lead to excessive rainfall. Slow motion of the hurricane near landfall can lead to high amounts of local rainfall (e.g. Hurricane Danny – 1997; Hurricane Wilma – 2005; Hurricane Harvey – 2017; Hurricane Florence – 2018). Mountains/hills near the coast magnify rainfall potential due to forced upslope flow (e.g. Hurricane Mitch – 1998). Upper level troughs and cold fronts can lead to excessive rainfall (e.g. Hurricane Floyd – 1999). Larger tropical cyclones have larger rain footprints, which can lead to excessive rainfall owing to the longer time frame over which rainfall falls at any one location. High water vapor content in the atmosphere also contributes to excessive rainfall. As a hurricane moves farther inland and is cut off from its supply of warmth and moisture (the ocean), rainfall amounts from hurricanes and their remains decrease quickly, unless there is upslope flow from mountains/hills. Roth (2017) provides a list of the hurricanes that were the biggest rain producers for each country/island in the North Atlantic (Table 5.2). The table does not include Hurricane Harvey’s (2017) rainfall of 60.58 inches, which occurred after this table was prepared. It is seen that Hurricane Mitch (1998), Hurricane Wilma (2005), Hurricane Flora (1963) and the November 1909 Hurricane each had peak landfall rainfall amounts exceeding that for Hurricane Harvey. Table 5.2. 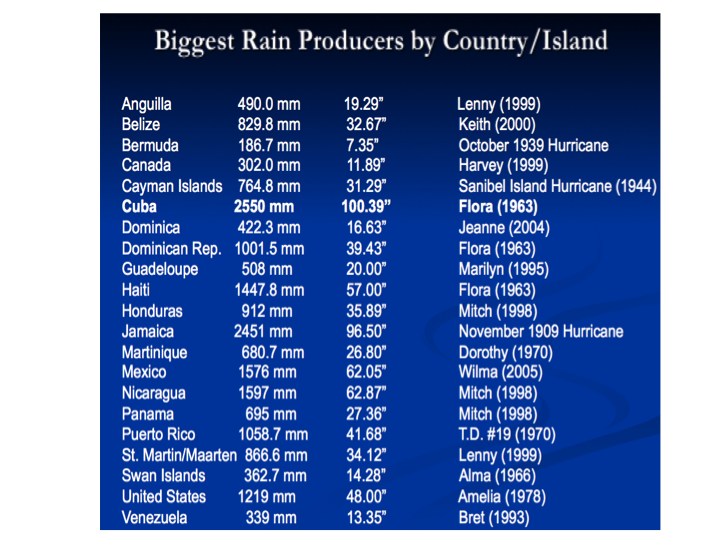 List of hurricanes that were the biggest rain producers in the North Atlantic. Source: Roth (2017). Knight and Davis (2007) found that between 1980 and 2004, tropical cyclones in the Southeast U.S. tended to be wetter, with 11 of the 84 stations analyzed showing statistically significant increases in tropical cyclone rainfall. No stations had significant decreases. Over this period, they found that the increase in frequency of landfalling storms was a more important factor in the increase in hurricane rainfall, rather than the fact that individual storms have tended to be wetter. Kunkel et al. 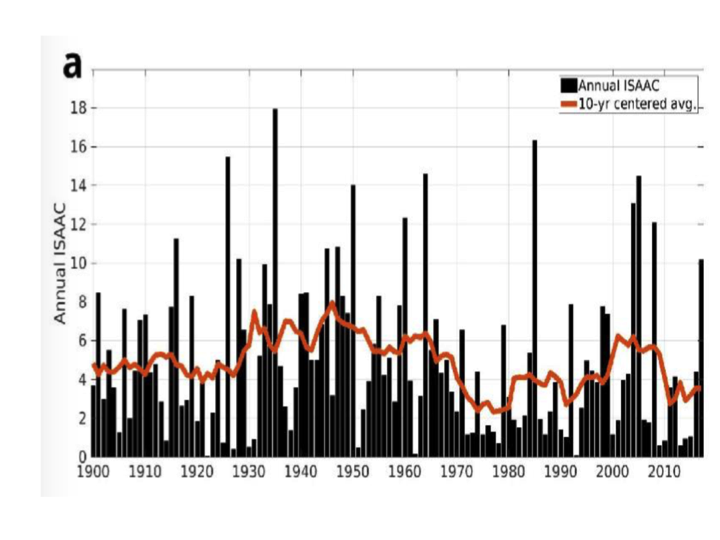 (2010) found that the number of Southeast U.S. tropical cyclone heavy precipitation events more than doubled between 1994 and 2008, compared to the long-term average from 1895 to 2008. The magnitude of a storm surge depends on storm intensity, forward speed, size (radius of maximum winds), angle of approach to the coast, central pressure, high tide versus low tide, and the shape and characteristic of coastal features. Sea level rise also influences the height of storm surges. Since 1900, global mean sea level has risen 7-8 inches (see Curry 2018a for an overview). Depending on local topography, a small change in sea level can translate into a significant increase in the inland reach of the storm surge. The highest documented storm surge in the U.S. occurred in 2005 during Hurricane Katrina, when Pass Christian, MS, recorded a 27.8 foot storm surge. As summarized by Belanger et al (2009), most hurricanes spawn tornadoes. Hurricanes making landfall from the Gulf of Mexico are more likely to produce tornadoes in the continental U.S. than Atlantic landfalling hurricanes that strike the U.S. coastline obliquely. Although most of these tornadoes are weak, there have been cases when significant death and destruction has resulted. Hurricane Ivan (2004) generated an outbreak of 117 tornadoes that resulted in 47 injuries, seven deaths, and $96.9 million in property damage. In view of the undercounting of tornadoes prior to the mid-1990s, when the national network of weather radars was completed, Belanger et al. developed a statistical model of hurricane-spawned tornadoes using data from the period when the weather radars were available. From the reconstructed tornado data for the period 1920-2007, Belanger et al. concluded that the active period since 1995 has seen an increased in the average number and in the frequency of large hurricane-spawned tornado outbreaks in the Gulf of Mexico – dominated by the high number of hurricane-spawned tornadoes during 2004-2005 that was unprecedented in the reconstructed record since 1920. These changes are linked to an increase in the median size and frequency of large Gulf landfalling hurricanes with large horizontal extent (size). Relatively little research has been done on climatic variations of hurricane size. Belanger et al. found the reconstructed climatology of hurricane-spawned tornadoes clearly reflects the decadal-scale variations associated with the Atlantic Multidecadal Oscillation (AMO). A satellite-based hurricane size climatology was developed by Knaff (2014). Some limited information on the variability of Atlantic hurricane size is provided by Fritz (2009). Figure 4.10 shows the Atlantic season average of the maximum radial extent of 34 knot [39 mph] wind speeds (R34), for the period 1970-2005. While substantial year-to-year variability is seen, a large jump occurs in 1995, associated with the transition to the warm phase of the AMO (Section 4.3.1). Figure 5.11. 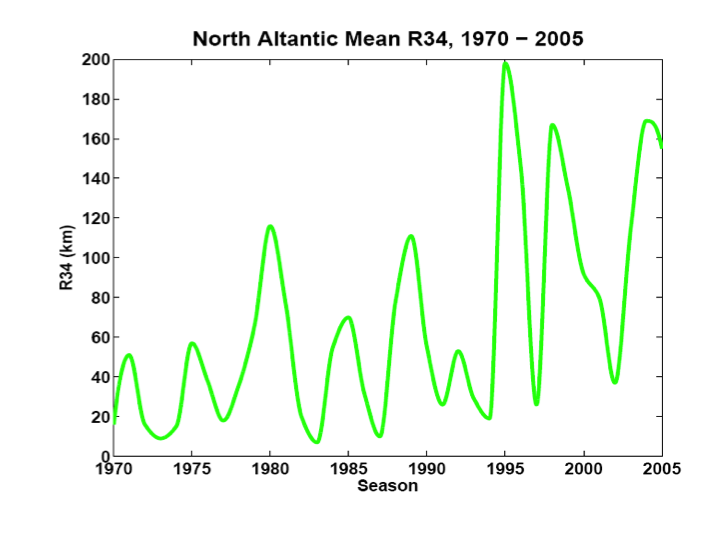 Time series of seasonal average of the radius of R34 for the North Atlantic, for the period 1970-2005. Unpublished diagram from A. Fritz, using the data set described by Fritz (2009). Given the importance of hurricane size in landfall impacts (storm surge, rainfall amount, tornadoes), increased attention should be given to documenting and understanding the variability of tropical cyclone size. Data collected by MunichRe (2018) show that worldwide economic losses from landfalling tropical cyclones have increased over the past decades. Historically, the greatest amount of damage from landfalling hurricanes has been from winds and storm surge. Recently, we have seen several storms where the greatest damage occurred from inland rainfall, particularly for slow moving storms (e.g. Hurricane Harvey in 2017 and Hurricane Florence in 2018). While there is no observational evidence of increased frequency or intensity of landfalling hurricanes, either in the Atlantic or globally, there is very clear evidence of increasing damage from landfalling hurricanes. Is this increase in damage solely attributed to increasing population and wealth in vulnerable coastal locations, or is there an element of climate change that is contributing to the increase in damage? Addressing the issue as to whether there is an element of climate change that is contributing to the increase in damage from landfalling hurricanes requires the correct identification of the relevant variables driving the damage. In addition to the frequency and intensity of landfalling hurricanes, the following variables contribute to damage: horizontal size of the hurricane, forward speed of motion near the coast, storm surge and rainfall. Klotzbach et al. (2018) and Weinkle et al. (2018) have addressed the question as to whether Continental United States (CONUS) hurricane-related inflation-adjusted damage has increased significantly since 1900. Both studies remark that since 1900, neither observed U.S. landfalling hurricane frequency nor intensity shows significant trends, including the devastating 2017 season. 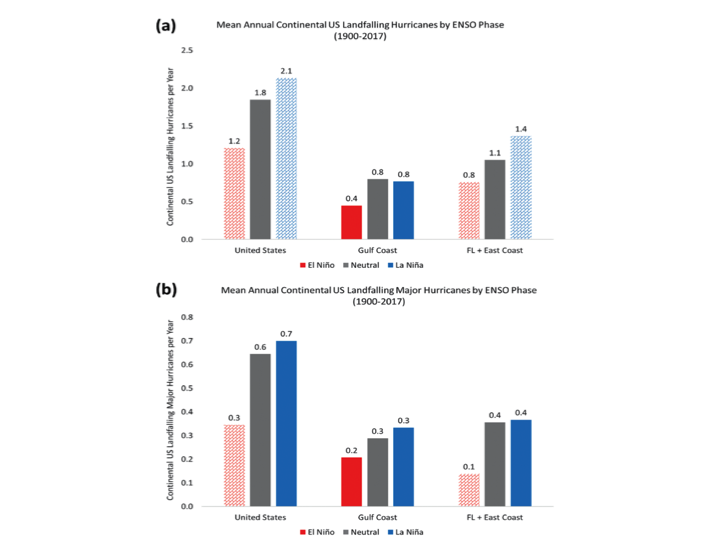 Growth in coastal population and regional wealth are the overwhelming drivers of observed increases in hurricane-related damage. This trend has led to the growth in exposure and vulnerability of coastal property along the U.S. Gulf and East Coasts. Klotzbach et al. and Weinkle et al. 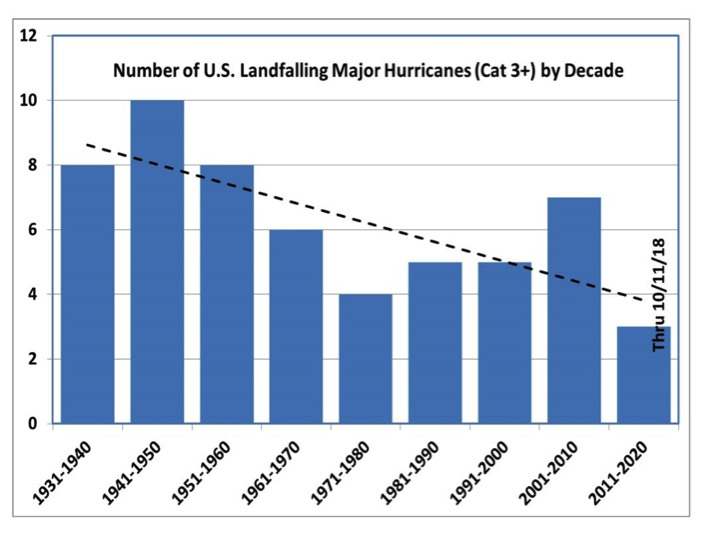 argue that given that there are no significant trends in the frequency or intensity of landfalling U.S. hurricanes since 1900, we would expect an unbiased normalization to also exhibit no trend over this time period. Estrada et al. (2015) argue that the damage normalization approach used by Weinkle et al. and Klotzbach et al. is ambiguous owing to unobserved variables and spatial variability, e.g. changing adaptation practices and local vulnerability. Further, exposure to hurricane damage is not uniquely determined by landfall frequency and intensity: horizontal size, storm surge and precipitation amount are generally independent of storm intensity. Warmer sea surface temperatures are expected to contribute to an overall increase in hurricane rainfall; the extent to which rainfall has increased in landfalling hurricanes remains an active area of research. JC note: stay tuned for Part IV, on attribution of recent major U.S. landfalling hurricanes. The number of cyclones in Fig 5.9 indicates that the 18th C suffered about 50 cyclones. The link below has good records of more than 200. The 1770s and 80s were particularly hard on ports and shipping and this period coincides with warmer W Atlantic SST as in:Tierney et al 2015. Figure 5.9 shows hurricanes passing through 10-20 degrees N latitude at 61 degrees W longitude, i.e., storms likely to hit the Caribbean islands, not the entire Atlantic. A quick look at the data base ( The Sevilla records are excellent) on their location shows a much higher rate, in particular for the decades of 1770 and 1780. The point being made that this apparent rise in frequencay and severity does appear related to higher W Atlantic SST. Given the interest of JCs post in cyclone related damage the suggestion is that this is worth looking into. The main lesson we learned from Hurricane Katrina seems pretty much unchanged– that there is no really good way to build a city below sea level along the Mississippi River in the Gulf of Mexico. My experience is that water based properties have appreciated significantly greater than non-water based properties over the last 50 years. Caution should be used in assessing the inflation adjusted damage amounts unless this is taken into consideration. Besides SLR affecting storm surge damage, gradual hardening of the coastline has lessened the capacity of natural barriers along the coast to absorb those surges. Millions of acres along the coastline are topographically and ecologically different than they were 150 years ago. Thanks for another excellent analysis. More bookmarks. More reasons for uncertainty. After listening to some congressional comments about dire predictions of global warming today, there are 535 sets of eyes that should be reading this material. Awaiting on only the Arctic for a slam dunk. Texas and Florida are among the fastest growing states in population. One might expect “damages” to increase both in assessed value and number of properties. Americans still are fleeing to the sun belt to escape winter. 26 million properties lose $15.8 Billion over 12 years. In 763 years those multimillion dollar mansions on the ocean might be downright affordable. The owners probably spent more annually on sushi dinners than their loss in value of their homes. you have an interesting way of minimizing the damage others suffer. I have seen that tactic before? where? TLDR: The evidence is weak. Reported death counts are overexaggerated, and the 6,000,000 dead Jews figure is especially wrong. Other groups supposedly included in the Holocaust (such as disabled persons) were not included in the Holocaust. This is all beside the point. It is foolish to build too near the shoreline. The government has subsidized the trend with flood insurance. It’s a classic example of poor government policy leading to damages and losses. You’re a hoot. When Colbert retires you may have a spot waiting for you. Apparently, you didn’t do the math. Per property, the so called loss is chump change, peanuts. That’s why I referenced the sushi dinner. Go real slow and calculate the loss per year per property. Get it now? Even controlling for the factors the authors did, it is a farcical exercise. Something along the lines of the Santer paper. But nice try in copying the catastrophic headlines ala NYT. If a person actually does the research and learns the reality, faux journalists at the Gray Lady have nothing but fluff. Just like the NYT, there is no there there. Reblogged this on Climate- Science. Should read more first but surely one cannot use economic losses as an indicator due to the change in economies with time. More houses, more buildings , more people and inflation means there is no reliable, justifiable way to compare current apples with past oranges. R Pielke Jun possibly has a way of trying to the value of the economies at different times. As would any decent Insurance actuary . – Nonetheless the damage is also wrought over greater economic and population areas as their current sheer size means they will be entered in areas that were previously not touched over worse double counted due to overlapping with past events. Area of extent, wind speeds and duration plus rainfall area are the critical useable factors. A sad lack of English appreciation. One would expect a trend almost always whether using an unbiased or biased or any sort of normalization. That is what one has to get when you compare two sets of data. What should have been said we would expect (still wrong given importance of the site and elevation of landfall) is that we would expect similar trends in the amount of energy entering the land space. Of course a trend could be identical to the other trend. This sort of outcome is far more frequent than chance allows and is due to human calculated input, not human error. By 6-8 Tg per ppm increase in atmospheric CO2. That means more trees 🌲 to get in the way of those hurricanes. So CO2 is sabotaging all those worthy efforts to generate alarm about hurricanes. Another pernicious effect of the bad gas. That paper is looking ar extratropical storms, ie ones driven by jet stream vorticity and release of LH. As such it highlights the correlation with the meridional reduced deltaT that is major effect if AGW due polar amplification. ❶①❶① . . . Why is Climate Science different? . . . Climate science is probably the only branch of science, that doesn’t look at absolute measurements. Climate science looks mostly at temperature anomalies. To calculate temperature anomalies, you need to use absolute temperatures. But Climate science then ignores the absolute temperatures, and concentrates on the temperature anomalies. For this article, I have sorted the data by the temperature of the average month. Humans love the temperature to be warmer than the average land temperature. They choose to live in warmer places. There is plenty of cooler land around. Humans don’t want to live on the cooler land. But global warming will make the cooler land, warmer. It might become desirable. Countries with a lot of “cool” land, like Russia and Canada, will probably become the next world superpowers. I suggest that you learn to speak Russian, or Canadian.